The user interface for collecting survey data has been completely re-done. While existing customers will still recognize the interface as similar to the previous version, everything was modernized and improved. Watch the video below to get a glimpse of VisiWave's new data collection interface. In the video, data is collected using both the Continuous and Point-by-Point capture modes, data points are moved and deleted, multiple data points are easily selected, and the floor plan is zoomed and panned. Do you have some extra analysis you would like to perform on the survey data you collected? Do you want to load the survey results into a different program for viewing the results? Now VisiWave Site Survey gives you the ability to export both the data collected and the values behind some of the views. The data is exported in either the XML format or the Comma Separated Values (CSV) format. 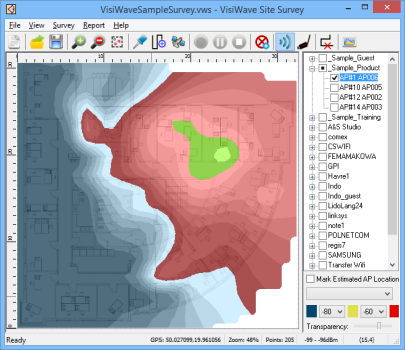 A "Pro" version of VisiWave Site Survey was added with the v5.0.8 release. For those that have a Pro license, you now have the ability to perform WiFi predictive surveys as well as traditional site surveys. Predictive surveys use a model of the survey area that you create to predict what WiFi coverage will be. 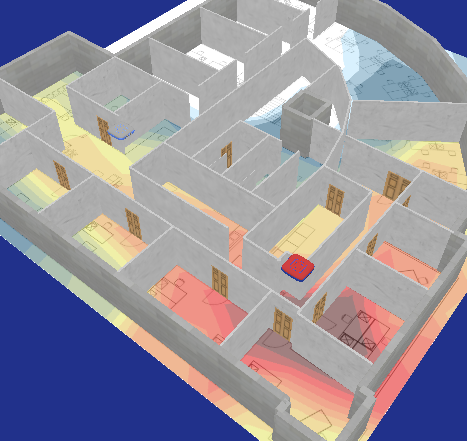 You describe the building's structures and access points and VisiWave Pro uses a mathematical model to predict the resulting real world coverage. The user interface for collecting survey data has been completely re-done. While existing customers will still recognize the interface as similar to the previous version, everything was modernized and improved. This feature alone is enough to justify the upgrade for owners of previous versions. You can view details about each AP seen at every data point. When you select a survey point, a table below the survey map lists all APs seen at that point. When collecting new survey data, the table lists details on all APs seen in the most recent scan. You can export survey data as either an XML file or as a Comma Separated Values (CSV) file. XML files are useful for processing the results using other tools. CSV files are easily loaded into spreadsheet programs (or other tools) for further analysis. You can export details about each data point collected and/or export the data used for various VisiWave reports such as heatmap data, AP Locations, or Overview Statistics. This version better handles characters from the entire world rather than just the characters from English. The first half of an Access Point's MAC address consists of the Organizational Unique Identifier (OUI). This indicates the device's manufacturer. The last half is that device's serial number. When showing MAC addresses, VisiWave maps the OUI to a shortened version of the manufacturer's name and follows this with the serial number. This allows you to quickly identify the AP's manufacturer. You can give each AP your own meaningful name. These names are stored with the survey file data. Additionally, they are added to a master list so when that AP is seen again in a different survey (using the same computer), the same meaningful name is used again. You can easily use either a laptop's mouse/touchpad or use a touch screen. VisiWave lets you use large icons when using a touch screen. And it supports normal touch screen operations like pinch to zoom or finger gestures to pan the view. And a multi-select tool lets you easily select objects using only a touch screen. If a survey data point is accidentally collected in the wrong place, you can relocate that data point at any time. 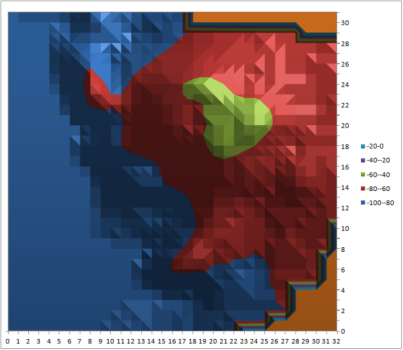 This includes moving entire segments of data points, if necessary. And, you can easily delete one or more invalid data points. When collecting survey data using a tablet without a mouse pointer, you still see visual feedback on where a data point is being added. Also, the feedback indicates when the scan is complete. Compared to previous versions, when collecting data using Continuous Mode, the location of the automatically placed survey data points is more precise. All data that is needed by VisiWave is stored in the survey file (.vws). This includes floor plan images and external images used by a report title page or other images/photos included in the report. 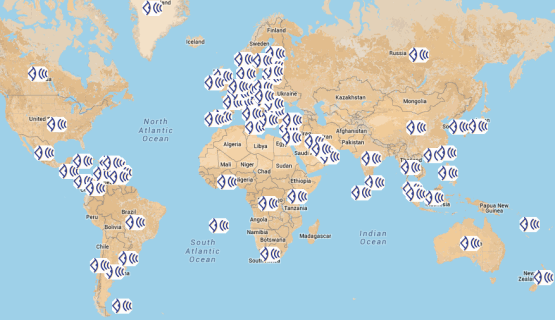 VisiWave has been on the market for over 15 years, is used by over a dozen Fortune 100 companies, and has customers in over 80 countries and almost every US State. Below is a list of the new features that were added in version 4.0 of VisiWave Site Survey.